My cousin Claire and I like to get together once a month to tackle a new skill in the kitchen. This month we decided to try our hands at sausage making. I didn’t think homemade sausage would taste so much better than store bought…but it does. (No hard gristly bits to chew on). Before even contemplating sausage making at home, be forewarned; it takes several hours and requires some specialized equipment. You will need a meat grinder with a coarse cutting plate and attachments for stuffing the sausage. We used Cuisinart Meat Grinder with Sausage Attachments. There are some other key points I’d like to stress before you tackle this project. 1. The meat and fat must be thoroughly chilled at all stages of production. You don’t want the fat to ‘melt’ into the meat at room temperature. 2. It is important to follow a minimum ratio of 80% meat to 20% fat in sausage making. Too little fat results in dry, fibrous sausage. (This recipe contains about 25% fat). 3. Pork fat and sausage casings are not available at most grocery butcher counters. These items require a visit to a reputable stand alone butcher shop in your neighborhood. 4. Novice sausage makers will find the process more enjoyable with a buddy. Feeding meat into the sausage stuffer, while guiding stuffed sausage out of the machine, is like rubbing your belly and patting your head at the same time…possible but unnecessarily stressful. With two people working on two different sausage recipes, you go home with variety! 1 hour before you want to begin working, place the meat and fat in the freezer to thoroughly chill. Mix spices and salt in a small bowl and set aside. Store sausage casings in cool water until needed. (I kept them in the fridge). Remove meat and fat from the freezer. Dice the meat and fat and place them into separate bowls. If your meat has large portions of fat, cut those off and add them to your reserved pork fat. Return meat and fat bowls to the freezer to chill. Wait 20 minutes. Have a glass of wine, now that cutting with a sharp knife is out of the way. Consult the machine’s assembly instructions to ensure blade and grinding plate are positioned correctly. Using the coarse grinding plate, feed the fat through the meat grinder. Collect the fat in a small bowl. Return the fat to the freezer to chill. Repeat with meats and a large bowl. Chill meat and fat for 20 minutes. Remove meat and fat from the freezer. Sprinkle meat evenly with spice and salt blend and thoroughly incorporate. Mix in 1 cup of German Weiss Bier. The beer should be absorbd nicely and not pool at the bottom of the bowl. Mix in the fat so it is evenly distributed. Be careful not to over mix and dissolve the fat pieces into the meat. Return to freezer. Wait 20 minutes. When you have stuffed your last bit of meat, turn off the machine. Tie a not into the end you started with, and start forming individual sausages. Loose spots or air pockets can be filled by massaging and compressing the meat. At the desired length, twist off the sausage link. Repeat with remaining links until you are finished. Tie off the last sausage and lay them out to dry. If you can, hang them on a wooden clothes drier to air-dry, or on a clean large surface. Flip sausages after an hour if one side is flush with a counter-top. Store sausages in a covered container and place in the fridge overnight. The following day, snip off the sausage segments and freeze any sausages that won’t be consumed within a few days. 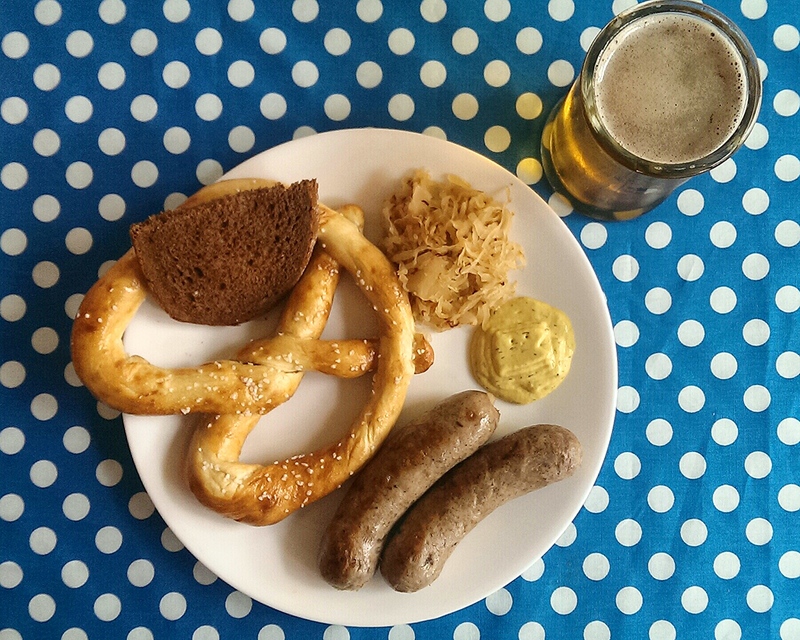 Enjoy sausages with sauerkraut, mustard, pretzels and beer. The Bratwurst sausage coils and the meat grinder fitted with the sausage stuffing attachment. My cousin Claire made the Chorizo on the left. I made the Bratwurst on the right. Here we are holding up our sausages.